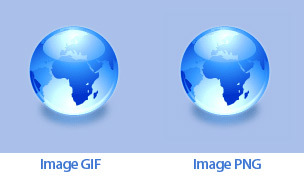 Using only PNG instead of GIF in your templates… maybe not! However in Webdesign, this advantage can be a drawback because of the lack of compatibility between the various navigators, and in particular on Internet Explorer where we are obliged to use to functions owner not always easy to set up to obtain the discounted effect. 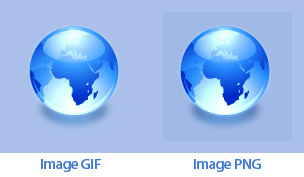 The use of a PNG image or a 256 colors GIF image on an HTML page with a coloured background could seem identical for you? In fact, there is a difference! The result between the 2 images proves to be identical on navigators like Firefox and Netscape but not on Internet Explorer (IE version 6.0)! The interpretation of the png on IE causes a light shift of colors between the background of the image (here a blue #AAC0EA) and the background of color defines in the HTML page. Even if the HTML background has an identical hexadecimal code, it is slightly different.